This easy to make flapjack is super sweet, it is more biscuity rather than cakey as it’s quite crunchy, so it’s perfect for taking with you to work/school/uni as part of a packed lunch. Chocolate chips/melted chocolate on top goes perfectly with this (especially dark chocolate, as it’s a nice contrast to the sweet flapjack). I’ll probably be posting more flapjack recipes soon (one that is a little more gooey/chewy), just give me a little time to experiment! Preheat oven to 150C. Lightly grease a 20cm baking tin. In a large pan, melt together the margarine, sugar & syrup, while stirring. When melted, remove from the heat and stir in the porridge oats. Place the tin on a wire rack. Cut into squares after 10 minutes, but leave to cool completely before removing from the tin. 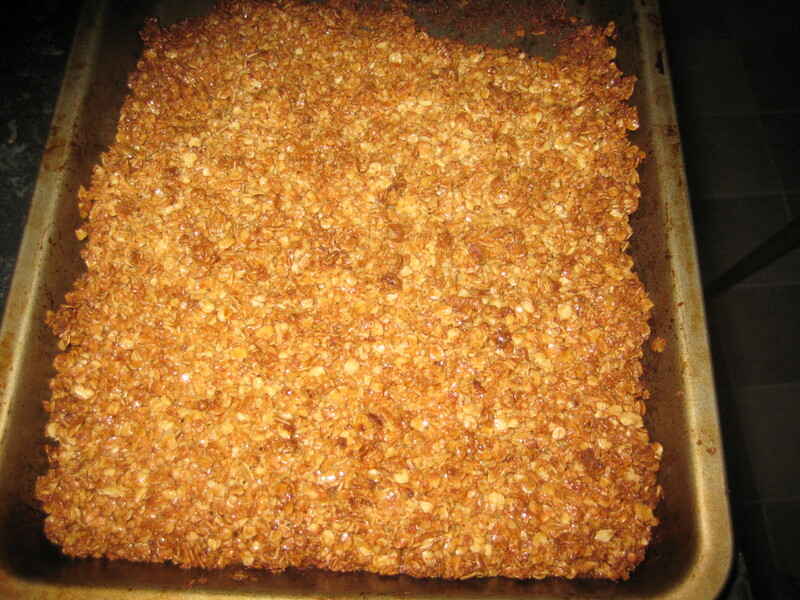 This entry was posted in dessert and tagged desserts, flapjack, oats, vegan flapjack, vegan recipes. Bookmark the permalink. ← Help me… I am a new vegan!